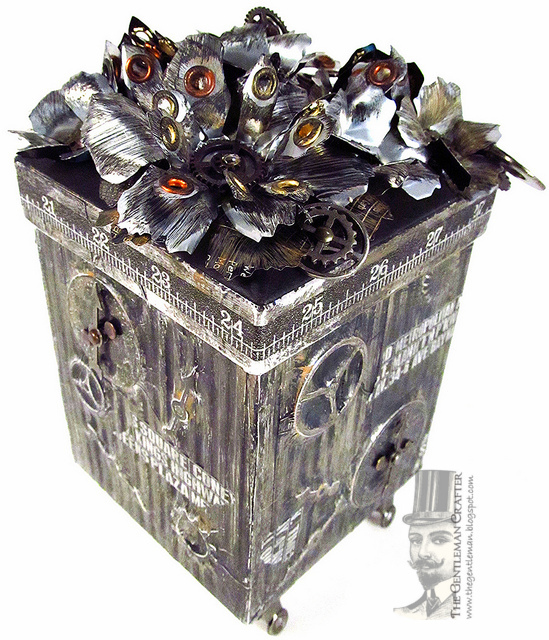 The Gentleman Crafter: Tattered Florals Steampunked & Giveaways! Have you heard about the coolest happening in blog land? I had to join in on the fun of Tim Holtz Tattered Floral Challenge! Yahooo! 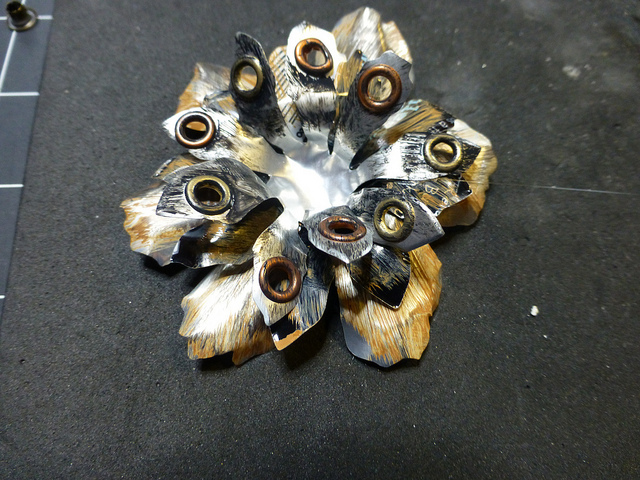 Here's a link if you want to join in too... http://timholtz.com/tattered-floral-challenge/ Wow! SO MANY AWESOME IDEAS and AMAZING PRIZE PACKS! 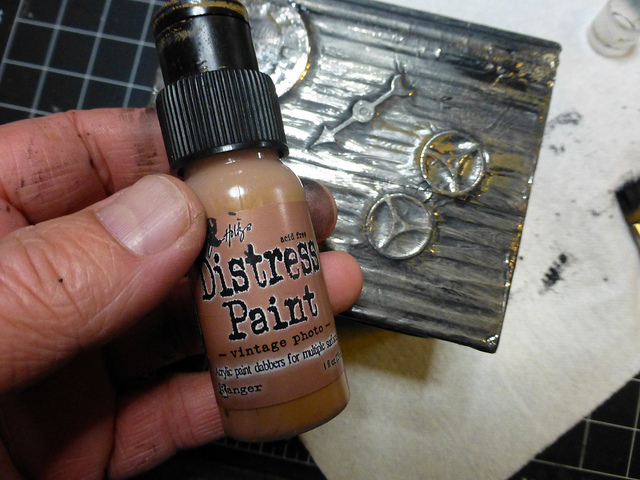 Next, Tim Holtz new Distress Paint in Black Soot and Vintage Photo was added to the petals. The box was covered with Wendy Vecchi's Embossing Paste using the Wendy Vecchi Studio 490 Yikes...Stripes Stencil and allowed to dry. 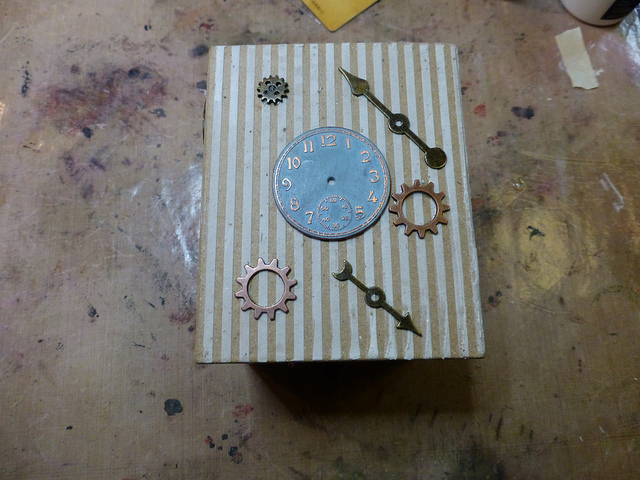 Next, Tim Holtz Idea-ology Game Spinners, Time Pieces and Sprocket Gears were added to the sides. 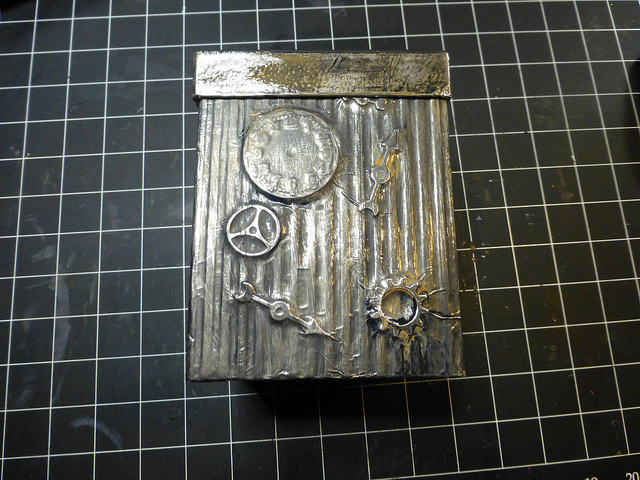 Inkssentials Metal Foil Tape was added to the sides and I burnished over the raised pieces and stenciling. 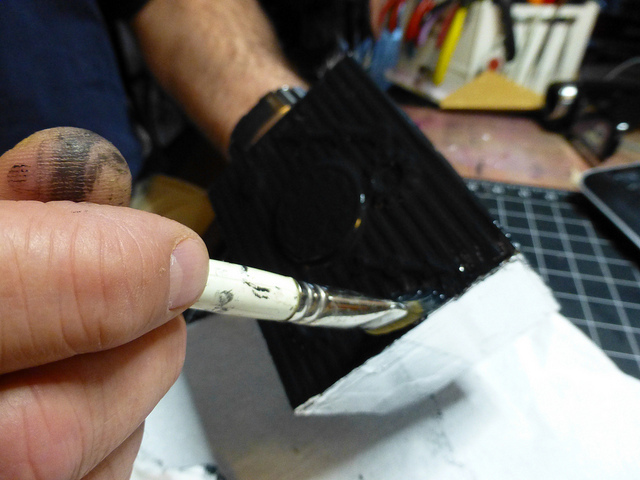 Tim Holtz Black Soot Distress Paint was applied to the foil tape and wiped off leaving the recessed areas with paint. Last, Vintage Photo Distress ink was added to accent the black. For the final touch I added feet by gluing four hitch fasteners to each corner and clipping a Tim Holtz Hinge Clip to each. OK, now for the fun!...The Giveaways...please be a follower and leave a comment here on my blog for a chance to win the one die Tim was so kind to give us and the Steampunk Tattered Florals Box shown above by the noon March 22nd Central Standard Time. That's it! I will do a random number drawing for the winner and post the winners name by March 23rd. Let's have fun and do some floral goodness with Tim's Tattered Florals Die! Yahooo! I am amazed by your work. I find it extremely inspiring and I love the fact that you look at an object and imagine so many things in it. Holy guacamole! That box is freaking AWESOME!! eek ipad went wobbly also wanted to say would looove to have one of your creations, you have convined me to get the embossing paste! Simply outstanding! As usual.I love all your attention to details, striping the box, decorating the flowers with all those grommets, hinge clips for feet! How does your mind work! Fantastic! Really my style too...lol! Love all the detail! You may just get me to like the look of steampunk after all! I love the idea of eyelets on the flower petals and the metal tape over the stencil and elements. You've taken ordinary items and made them extraordinary! Great project! I love the use of the metal cans and the attention to detail. Thanks for sharing your creativity with us. Oh my! What a cool little box. It makes me want to go in the craft room & play. I have had this die since day one and it is one of my favs too. Crafter's, like Woody says in Toy Story, " If you don't have one, get one!" Of course he was talking about moving partners, not craft supplies. It's almost the weekend, time to play! a give-a-way...count me in for that..keep up your fantastic ideas.. what fun !! This is so cool, Jim! Love the eyelets added to the petals...no wonder you need so many in your stash! Jim, I loved the idea to use the flowers and the eyelets. It's great together. AH-MAZ-ING! I already have the Tattered Florals die, but I just wanted to tell you! Seriously Jim? Wowie! Love the Steampunk flowers. Yahoo. You rock! Thanks for the inspiration! Oh yes please! keeping my fingers crossed for this one. This box is lush....I love it! What can I say.... I am droowling here over my laptop, I'm loving this box and the flowers ars so stunning. If I am the lucky one I will give mine away. The striped affect on the box is wonderful. And, the flowers. Oh my! You are beyond clever and talented. 1. 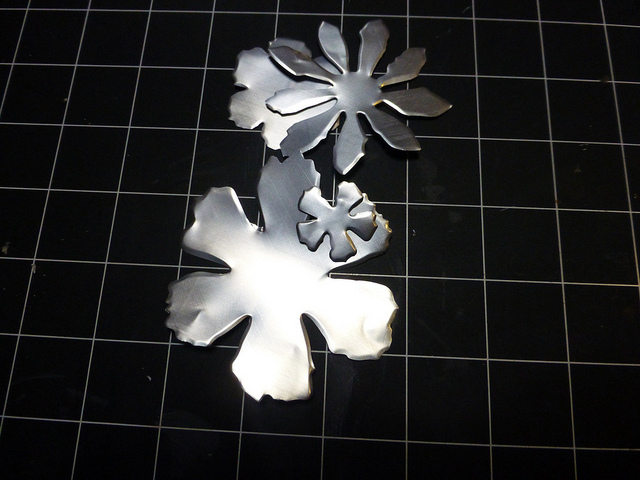 I've wanted to try diecutting aluminum cans but worried about sharp edges post-cutting. Is that why you 'stylused' around them or do they need to somehow be rolled under? 2. Doesn't the paint bead up on the metal or did you put something on there to get some tooth first? Awesome! Love the box and the flowers. 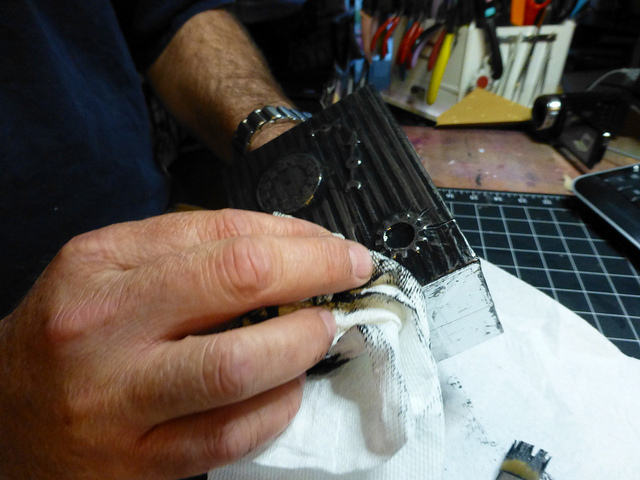 I've got to remember that you can cut metal with the Bigz dies. OMGosh!!! I LOVE this!!! This is a wonderful die--but not as amazing as your wonderful, inspirational creativeness!! I come here everyday for my "Gentleman Crafter Therapy" and always leave in awe!! Thank You for your humor and sweetness and generous giving nature! Sending you and Caesar much love......always! Hi Jim! Your project is AWESOME! I enjoy your video's and blog so much. Thanks T!M ! 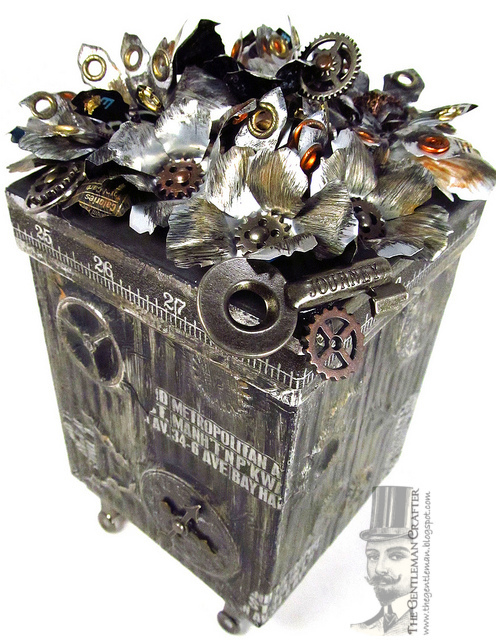 wow, what an amazing altered box, love all the elements on it, and the flowers are fantastic, love the steampunk look. Love to see what ideas you come up with so different from the usual. I also love your youtube videos and laugh a lot on your new USTREAM channel. Thanks for all the fun and inspirational ideas. What a fantastic idea, cutting the flowers out of soda cans! You have such a gifted imagination! I wish I lived next door to you (I promise I wouldn't stalk you)! Anyway, it would be so great to have a project done by you, thanks for the chance! LOVE your flowers...how in the world do you keep thinking up these super, duper, splendid, wonderful creations?!?!?! Please don't draw my name...already have the die and love it. What an awesome box ... love it, love it, love it! The Tattered Floral Die is one that is on my wish list and with the government budget cuts looming means budget cuts in this household so winning it would be awesome. Thanks for sharing all your amazing projects! I love your projects they are so unique and inspiring. This floral die has been on my wishlist for a while. Thanks for the opportunity to win it. Oh my... this is an outstanding project Jim!!! Just absolutely gorgeous!! Love how you added the eyelets to the metal flowers... so creative! I am crossing all my fingers and toes that I'll be the lucky winner of this amazing prize! Jim: Your box is so amazing! Those florals are so great and that you used soda cans really spoke to the green side of me! Thanks for the chance to win, I follow you already by email. Enjoy the weekend! Amazing...love all the detail! Adding eyelets to the flowers was brilliant! Congrats to the lucky winner! All I can say is----YOU ARE A GENIUS! That project is glorious. I need to drink a soda or two and make me some flowers! Not in a million years would I have thought to cut soda cans and I've got lots of them. And the paint on top. I learn so much from following your blog. I've gone from thinking I might want this die to knowing with certainty that I must own this die. Thanks for the chance to win it! I truly marvel at the projects you think up and this one is no exception - it is fabulous. Thank you so much for sharing the details! Beautiful flowers,Jim. What a great project. What? You drink Monster?!! NOW I understand your boundless energy! But seriously, this in an amazingly creative project. I love your work, and your blog. Thanks for sharing the inpiration! Jim, this box is SO "YOU"! Only you would think of metal for the flowers...so utterly a signature piece for you! Love the box! Great idea using the can for the flower, and steampunk one of my favorite looks. Thanks to t!m fo rthe dies and thanks to you for sharing your ideas, thoughts and creations so freely. Keep 'em coming. It's wonderful what happens when you're let loose with your craft stash. This project is simply ingenious. I love how you used Tuesday's tag technique on the sides of the box. The eyelets on the petals and then demonstrating why we needed hitch posts back. Just a joy to look at. 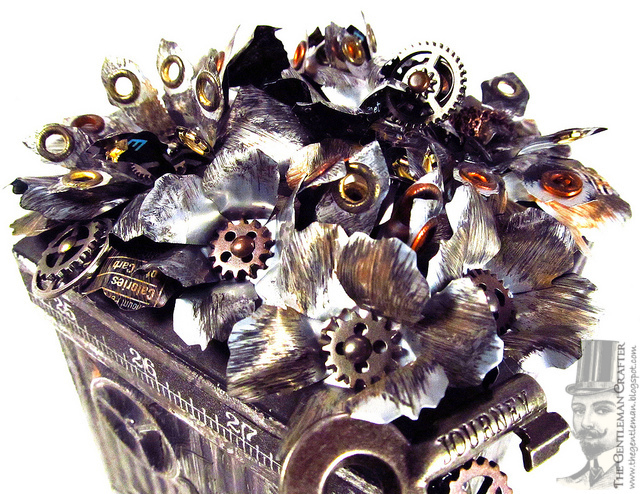 I would have never thought of using soda cans to make flowers...very impressive. Really like the project. Jim, you've done it again. This box is simply AMAZING!!! The detail is incredible, the colours are perfect and the eyelets truly inspired. Definitely a Jim the Gentleman Crafter masterpiece! WOW, this is amazing!! Absolutely stunning project!! I love, love the flowers!! Thanks for the inspiration!! The box turned out awesome. Turned out very cool! Thanks for the chance to win. I don't have that die! I love the project box, would love a tutorial. Perfect for gifting. Looks professional. Wonderful project!!! Thanks for the give away. Your projects are amazing and you are so generous with sharing them. Wonderful! And now I see why you absolutely had to have bronze eyelets! Way to go, Jim! Love the box and what you did with the flowers, its a really great die I really don't use mine enough. Oh My... I love your box! You rock... where to begin, you have so many wonderful pieced added to it! Do these idea's just come to you in your sleep or are they happy accidents? Just curious as I love your projects and this one blows me away! I have the Tattered Floral Die, so please do NOT include me in that drawing; but I would love to put into the "Top Hat" for your awesome box!!! Thanks and Have a fabulous weekend! What a lovely box! So that's what you needed the eyelets for! I'm guessing that you had to drink loads of Monster drinks too! Like Sara I already have the tattered florals die, but I'd love a chance to win your special box. Hey Jim, I love the flowers. I have a question about the Embossing Paste. Did you put the foil tape over it to protect it from chipping off? This is gorgeous, I am enjoying seeing all the many different things artists are doing with the tattered flowers. WOW is all I can say! I have used cans and love the way they turn out but it took your creative powers to add the metal bling and boy it is great. Now I can put a few on my grandsons mini and not feel bad at all! Thanks for your inspiration. So many ideas and so little time. I keep trying to figure out how I can work and craft at the same time. I don't think my employer will pay me for that. I love, love, love the look of the corrugated tin. Reminds me of my Grandparents farm! Thanks! Beautiful work. I love the idea you used soda cans to cut flowers out. I would of never thought of that. Thanks for sharing that idea. Love seeing your projects your very creative. So seriously impressed by your talent! Each project outdoes the one before. Love, love, love seeing your work. Thanks for always sharing. Thanks for sharing how you made the box. There are so many great ideas in this to inspire! I love the steamy look and the use of recycled soda cans which I've had fun with too for snowflakes. Leave it to you to come up with such wonderful flowers! Amazing project, thanks for sharing with the tutorial. This box is to die for!!! OMG, your amazing Jim. Love what you did with your tattered flowers!! Genius!!!! Seriously out of this world and beyond. OMG ... this is awsome! Wow Jim! I am completely blown away by your project. 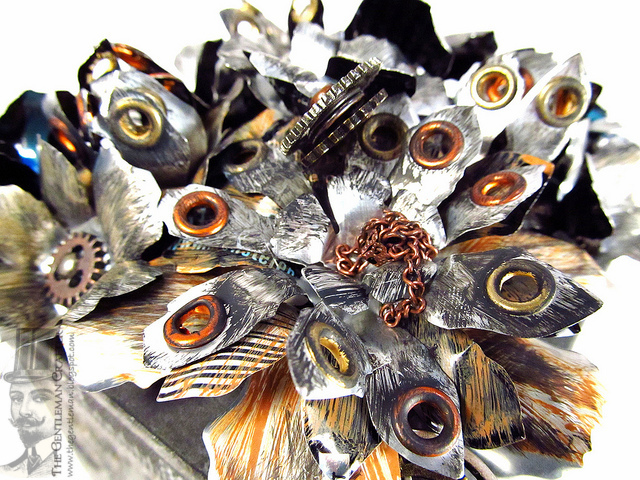 All your projects are genius, but this one is seriously cool - eyelets in metal flowers & embossing paste & embellishments under metal foil tape. Inspired. Hugs, Theresa. OMG!!! You are AMAZING!!!! You blow me away with all the amazing projects. I simpley LOVE your works!!! Amazing flowers..but im not surprised by your wonderful imagination! Thanks for the inspiration!!!! ABSOLUTELY stunning work. I am so impressed by everyone doing this challenge. Thanks Jim. 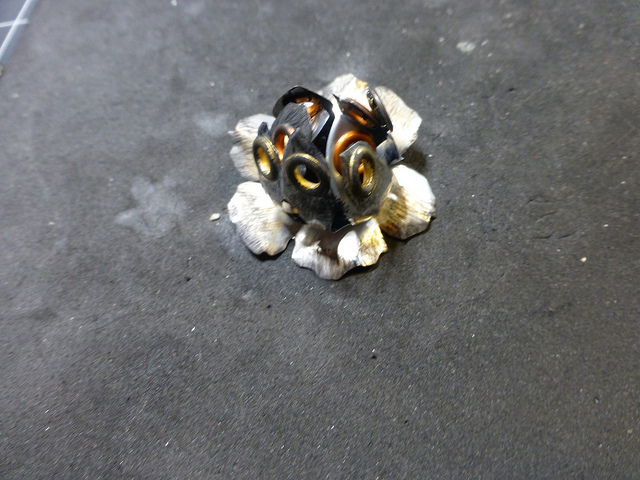 Wow you rock that die, never thought of steampunk flowers but i love them. Love your box and the Tattered Florals Die! Thanks for the eye candy as always! what you do is simply the BEST!! WOW this is amazing. I love your creations and I am so excited I get to watch you on Tuesdays!!! I would love to win just the box!!! Your work is absolutely, without a doubt, beautiful and amazing! I do not recall another artist with your creative ideas..........where Jim, do they come from? OMG Jim that is awesome! I love that you used pop cans. I am so gonna try that! What I especially love is that the pop can was an energy drink. They mystery of how you get so much done, is now solved! LOL! Oh Jim! That box of yours is absolutely amazing!! Thanks for the instructions on making it, I sure will try to make one myself when I have enough time on my hands! You know what I am going to say...."Craftgasm"!!!!! Wow! Absolutely love the concept. I agree with Anita "Craftgasm"! thanks as always for sharing. I did not think I wanted that die - I was wrong!!!! I am speechless! Just one word to describe your work "spectacular". Absolutely fabulous!!!! You are AMAZING! I am looking forward to attempting the tag box tonight. I've been following you for a few months, and love your videos, but mostly your work. You've got such a great gift, and the technology helps you inspire many of us. Thank you for what you do!!!! Wow! This is so amazing! I love it! I love all your projects, love that you think so totally out of the box. Hello Jim. I love Steampunk and you've taken it to an altogether new dimension with the tattered florals die. I am completely in awe over the effects you've been able to achieve! Aren't you the clever one. Thanks for sharing your talent with us. Steam Punk is alive and well with you. wow it looks great. This long winter here in the heartland is what that box reminds me of. Would love a die and the box, especially since YOU made it. You do wonderful work. Love the box and the flowers, very steam punk. Thanks for sharing. 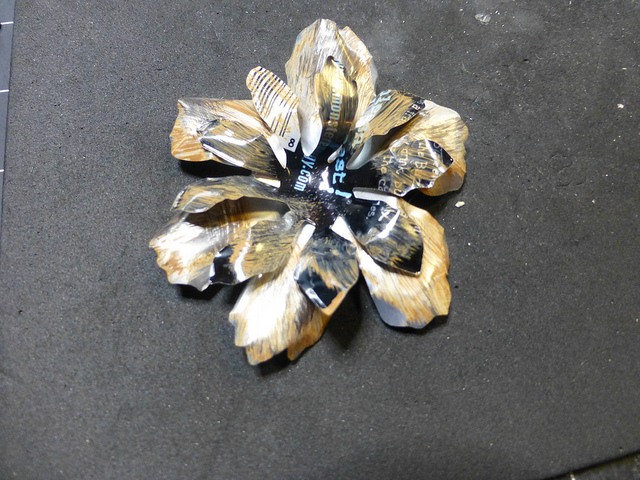 I thought I had seen all the ways you could alter this die/flower...but you didn't! Wow, what a way to change something sweet and pretty, and make it look modern and dirty! You did it again Jim! This is SO cool! I love it Jim. Totally amazing project. I especially love the eyeletted/grommetted flower petals. Jim: I've been a follower for a l-o-n-g time! I'm not a big fan of steampunk, BUT, I may have to revise my thinking...your "tattered flowers" are excellent. The gears and eyelets or grommets are genius. Thanks for sharing. I'm blown away by your creativity once again !!! 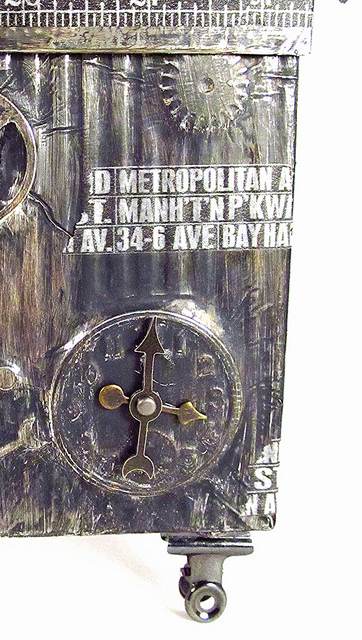 Another absolutely awesome project Jim and this is right up my crafty street as I love the grungy Steampunk look. Wow! Amazing take on the flowers! Your art is incredible! Love this! I will be thinking of project ideas! Pretty!!! Oh my goodness, Jim! Over the top with this beautimous creation! I want to spend just 5 minutes sometime inside your head!! Absolutely Fabulous!! Steampunked flowers - so cool!! The box is a beauty also! Oh my gourd! This is just so incredibly creative and dimensional and fun. Love that you started with a soda can. (If I start drinking Monster, will my mind find this creative flow you seem to live in?) The shine is wonderful...they almost look like butterfly wings. An incredible feeling of movement and life in this piece, Jim. You just keep raising the bar and then you jump right over it. Wow, wow, wow! This is quite probably the coolest thing I have ever seen. I am in awe. It's beyond gorgeous. this is amazing! I have not bought this die because I have so many other flower options..... well, that has now changed!!!! 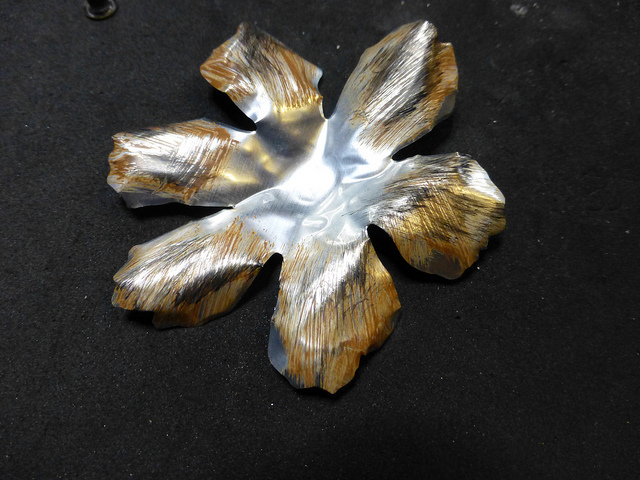 the metal flowers and being distressed---this whole project has so much inspiration in it. I'd love a chance to win this die and your creation. WOW, this is so cool on so many levels! Thanks for the wonderful step by step instructions on how you created it! Fantastic! You are truly amazing! The projects are so all inspiring. You have a gift, thank you for sharing it with us. HOLY SCRAP!!! This is AWESOME!!!!! You, sir, are tres talented!!!! Love the ideal of the embellishments covered with foil tape. Pop, Pop, Pop. Brilliant idea for the feet!!!! Forgot to tell you that earlier!!! Love how this came out!!! Ive been wanting to try that foil tape and now i MUST have it lol great project as always!!!! Love your creation. 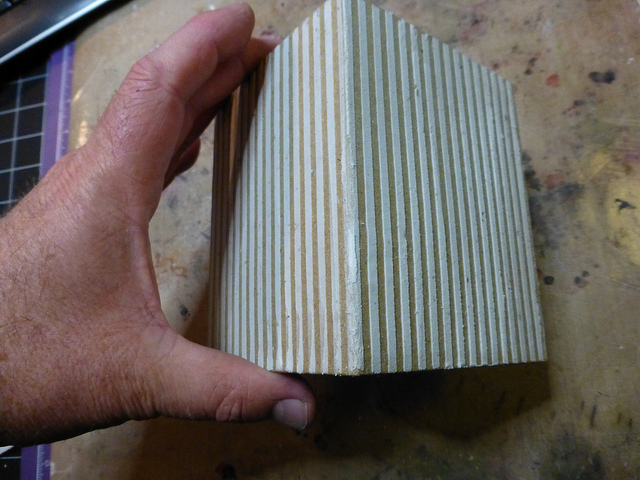 I was wondering how you made the box so I'm glad you showed how you did it, too simple! If I win I just want the box b/c I have this die so just pick a second person for the die! Jim, I love your creations. Thanks for the chance to win one. Your work is SPECTACULAR! What imagination!! Do not guess you would ever run out of soda cans, but I like using the vacuum seals from 3 lb can of coffee. Thank you for sharing with us. As always, a wonderful creation. I wish I had a smidgen of your creativity!!! Thanks for sharing. Love what you did with the flowers!!! That box is awesome!!! I can not believe you are giving the box of flowers away! It is so creative. marvelous! inspiring work.. wow! Thanks for sharing this! Please don't include me in the draw...I already own the tattered floral dies...one of my faves also. I don't even have to see the projects others have submitted. YOU WIN! There's not a single thing I don't like about your box, and many things I love. The eyelets and distress inking on the petals reminded me of peacock feathers. Perhaps you can do a peacock project one of these days. Exquisite, as always! OMG I am speechless with this amazing work of art! I would say you have won this challenge as your work is awesome. Good Gawd Gertie! Love it! fantastic work! always amazed at your work and look forward to reading your blog! Jim this just blew me away. So awesome!!!!! I can't believe you used a soda can. Question: How did the dies hold up after cutting into a soda can?????? Well even if it ruined them, it was worth it. Love the stripes. Just ordered some embossing paste, can't wait to get it so I can play. 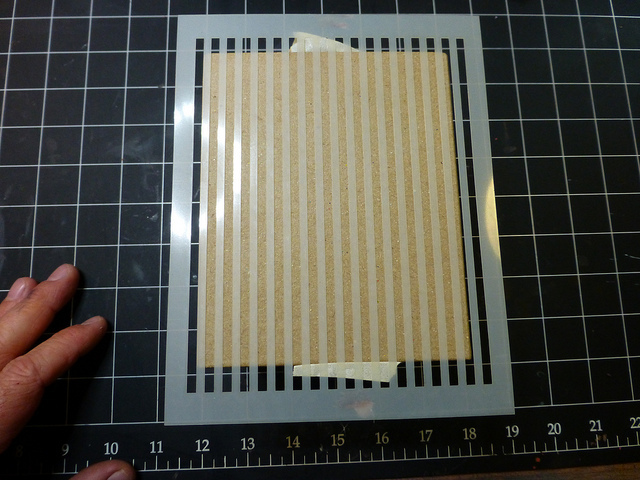 Now I need to pickup some stencils. Thanks Jim, you enabler you!!!!!!!! LOL. Great project as always. maybe i'm the only one not in the know, but i wonder what's your day job that you could construct your artwork so magnificently? I love the tattered flower die. I, too, do the tin cans. I use my tattered flowers to decorate antique windows! Hope I can win a new die! WOW!!! AMAZING!!! I am officially AWESTRUCK!!! You took my breath away with your beautiful creation!! Wow! That is a fantastic box! I don't normally "do" steampunk...but I *LOVE* this box. Cutting the flowers from the soda cans is a great idea! I love love love your flowers. I even dragged my husband over to see them. I thought they were beautiful. He thought he'd better start saving pop cans. Thanks Gentleman Jim. Thank you for sharing your amazing talents. i always love visiting your site. 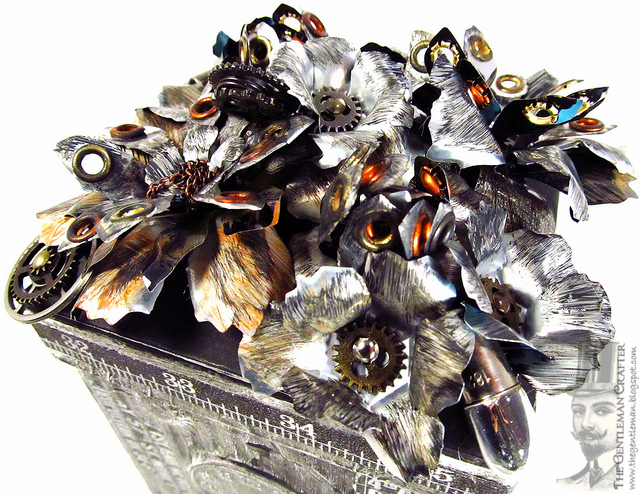 I've just become a follower and LOVE this fabulous box you have made with the tattered florals, Jim! For the past week I have been watching with much fascination your videos on Youtube! I love how you explain everything so thoroughly and will be watching more as time allows. Thanks for the chance to win the die AND the box! Wow! This is my first trip to your bog and I am truly amazed and inspired. 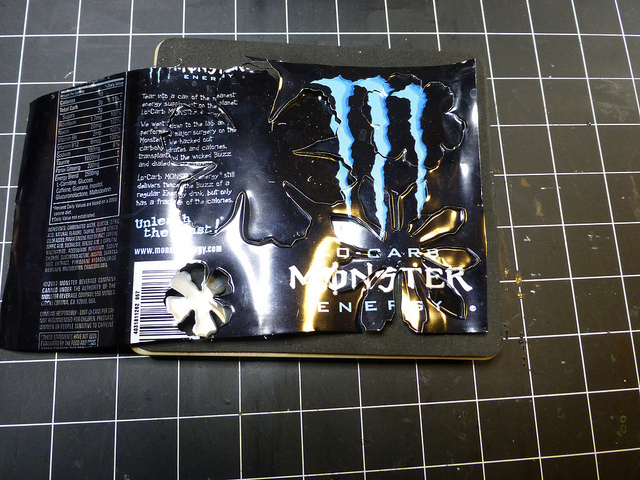 I did not know you could cut through soda cans with Bigz dies - I will be trying this tonight! You already KNOW you blew me away with those flowers right?! Had to check them out again :) !! You rocked them royally !!! Those flowersare totally amazing with a capital A. You rcked this challenge. I am a ollower and love your work. I can't believe we can win the die AND your wonderful, amazing box! I'm glad Tim shared your site. You have a new follower! LOVE your blog!!! You are so talented. Thanks for having the giveaway. Insane .... the eyelets are the perfect touch! I imagine you had to use up that huge box you bought when trying to find bronze! LOLOL Tim is right, you ARE over the top and I just love it!! Wow I love how you recycled and used the monster cans! You did an awesome job! Thanks for the inspiration! LOVE the steampunk box. Thank you for your tutorial and the giveaway. I don't have the Tattered Floral die and would love to win it for my collection. I'd love to have your box too for my craft room. I've been saving soda cans, now I know what I can use them for. Thanks!!! Wow, what an elegant box! I love it! Thank you for the tutorial! That gives me lots of inspiration. 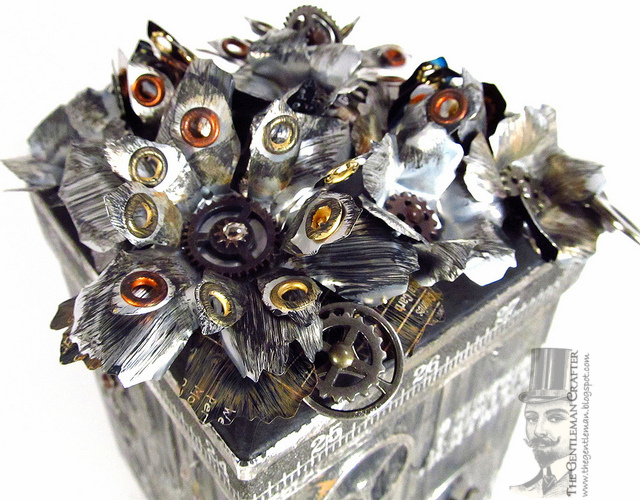 The Steampunk box is truly a work of art! And out of soda cans even! You are a creative genius. Thanks for the tutorial. I found it very inspiring. Your take on this challenge is surprising, spectacular and simply fabulous! This is absolutely stunning!! I love all the details you've put into this, it's just amazing!!! Amazing take on the tattered florals challenge. Totally cool! I just love your box!!! Love it! Love it! Love it! That is so cool! Thanks for the tip about using aluminium cans - what a brilliant thought! I love how you used eyelets on the edges of the petals too. Steampunk awesomeness!!! I had never thought about using aluminum cans with the sizzix-- too cool!! OMG - so fantastic! 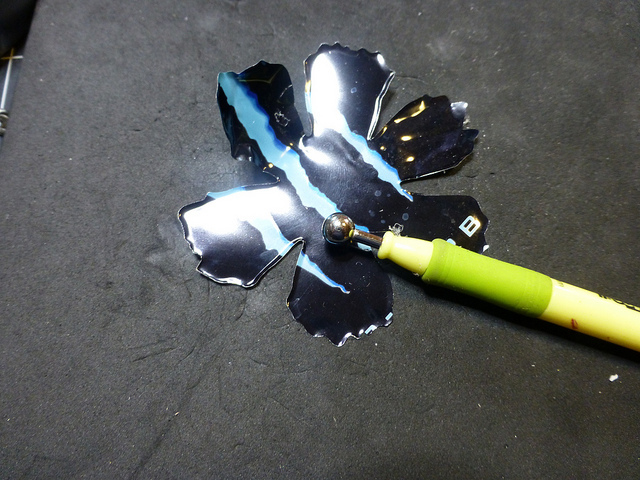 I submitted my tattered floral challenge on Sunday, and also cut mine from soda cans - but wow , they don't even compare. I added them to a "treasure" box for one of my young grand daughters and need to do another for my other grand daughter. Your steampunk box is amazing Thanks for sharing all of that inspiration with us. Love love love it! What a simply fantastic box Jim !! Those are beautifull, I will never look the same way at soda cans again. Love it!!! WOW! That box is amazing! You've inspired me to TRY new things - no holds barred! When I see so much detail, such creativity and enginuity, you leave me almost speachless! Thank you so much for sharing your creation in this challenge. Awesome! Love your creativity. Thanks for sharing. Always enjoy your creativity and unique approach to your artwork. Absolutely over the top- this project is outstanding! And it looks like you had FUN! !